There often comes a time when you are tinkering with the latest Android apps and suddenly Google Play Store pops up annoying “No Internet connection. 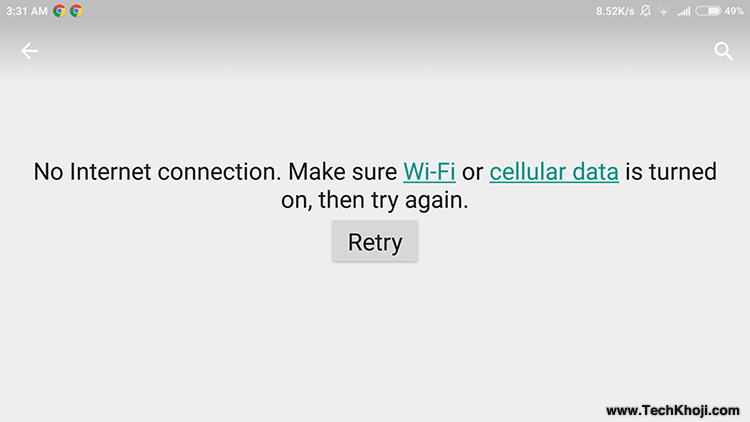 Make sure Wi-Fi or cellular data is turned on then try again, Retry” error message even though your WiFi/3G/LTE connection is working smoothly and all the other internet apps are running fine. When I first experienced this problem, I had no clue what made all Google Play services including Gmail, Play Movies, Music, Magazines stop working. I tried to use different WiFi connection, VPN’s, changed DNS servers, restarted my Android phone but still no avail. Then finally, after hours of struggle I came up with solution which one would have never thought of. It works 80 percent of the time. Google Play Services sync with their master servers to send and receive data, to do this your device time and date should be correctly set. I used to change time settings to cheat extra lives on Candy Crash Saga and later that turned out to be the main culprit behind connection error issue. Or alternatively, you can set time by yourself, just make sure it is correct. Sometimes ISP’s DNS servers cannot resolve domains of Google Play services. To fix that, you need switch to Google DNS servers from WiFi settings of your phone. It can also be done through your Internet Router. From your phone change the settings below given below. Go to Settings > Select WiFi Network (Hold Tap) > Select Modify > Show Advanced Settings. 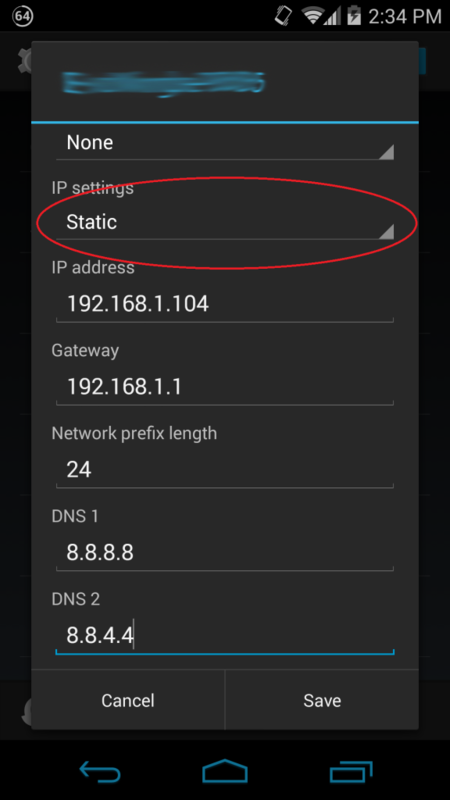 Then from IP settings drop box, change DHCP to Static and enter the details mentioned in picture below. Sometimes Google Play Store updates automatically and makes changes without user permission. If the above mentioned steps don’t help you, use the “uninstall updates” option of Play Store app, it will revert to previous version and may also fix the problem. Remove any existing proxy or VPN services and connect directly to the internet before accessing Play Store. Go to Wireless & Network, modify your WiFi settings, go to advanced options and remove any proxy servers. Disconnect any VPN connection or apps you have running in background. For advanced users only. 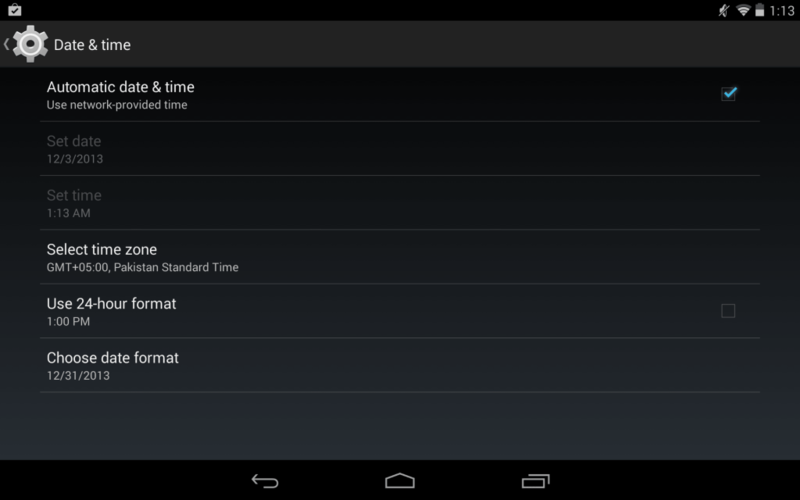 If you rooted your Android device, do the following. This comes as a last resort. If anything mentioned above does not work. It’s time to do a full factory reset to your phone. It will clear everything and put your device in its original condition. Make sure you back-up your contacts and files before you perform a reset, else you will lose everything. If the all the solutions don’t help, please contact your ISP if they are blocking Google IP addresses. You may also want to visit the service center of your Android phone/tablet manufacturer. If you have any tips related to this issue, post a comment. After updating to CM10.2 I had a lot of trouble with Google account sync and apps. Found out I had to update GAPPS …. which worked fine until an update for Google Music came out and it wouldn’t update. 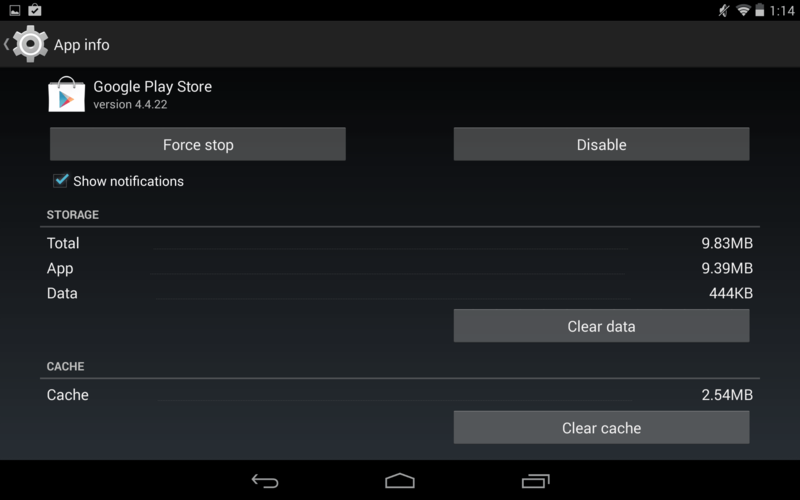 In ‘Manage Apps’ Stopping Google Play and clearing the cache solved the issue. You fixed my Google Play Store “No Connection, Retry” Problem – Immediately!! Worked like a charm, very nice. Thanks for your help! Deleting the hosts file solve my problem. Hi and thanks! The date was somehow set to 2000. All good now. when I tried to download any new app, there was an error message “no connection” we did factory data reset and enjoying all apps comfortably and now every app takes two to three minutes in downloading. Thanks for assistance whoever is concerned. step 6 delete host file. works for me, because I use lucky patcher’s ad block thaks a lot keep it up.. . Awesome … thanks uh i was dead….. i uninstalled the updates and et voila!! I am so glad I found this very simple and informing site I have been looking online trying to solve the no connection problem to no avail and literally 1 min on this site my question is answered LOL Thank you!! My child switched the date on my phone for a game cheat who knew it would create all this drama! Thanks again! Or download new play store replacing factory version.. Thanks btw. some times it happens. unfortunately .i ve tried every thing with my new tablet .it has been 1 week when i purchase it.i searched in web if i can make root but i found that it damage camera and screen .what should i do ?? ?please save me because i m going banana. I tried everything for hours and it was #3 that solved it for me! 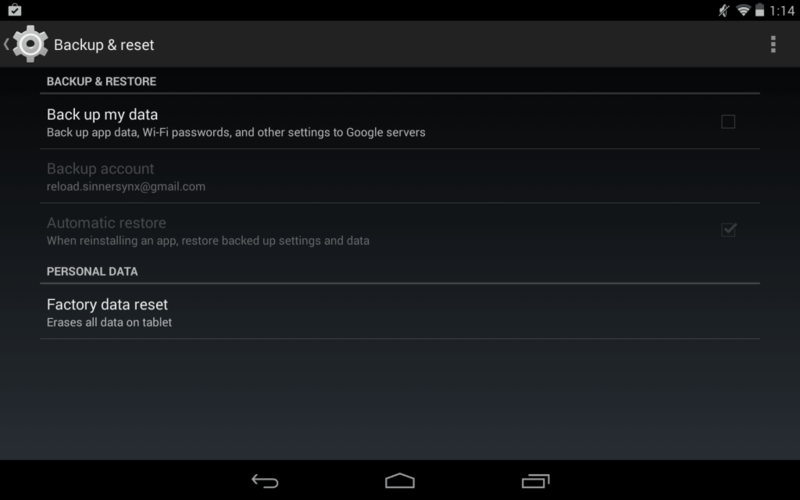 I just logged out of the google account under the settings, added the account again and everything was fixed. Thank you!! At last I am happy that I am not the only one, but all these methods I have tried but couldn’t find any solution to these login issues. I guess finally I should approach to service center. Thank you very much. My hosts file was the culprit but deleting it solved my problems. Thanks a lot for your help. I’m be able to Use playstore service. ….. Here is a short fix for the No Connection Error on play store. It may not work on all devices. 1. Download Total Commander from Play Store. 2. Install it in your Device. 4. Open the etc folder. 5. Find the file named “hosts”, and hold it for 3 seconds. Choose edit file, and choose Total Commander Text Editor if prompted. 6. Add —> ” # ” <— before 2nd line like this " #74.125.93.113 android.clients.google.com "
yeah. making time right is the only ways to solve no connection errors. Thanks to all. #6 worked! Thanks for saving me from another 6 hours of frustration! I cant figure out how two to delete the files on step 6. I’m trying to buy a Nextbook premium 8in. Cover for my tablet. Well something went wrong in entering my inflow. That I needed to install it again & again I went to the play store and mourning. I called your office , talked with a nice rep. We tryed defrient, things with no result. He said to keep trying,. I did. Nada.. so now it’s your turn .Can you please help me scropion123 < it works then it does not.. I had $25 in it. Still there HELP. Still i restsrted muy phone. Master reset un rooted and still nothing…. Thank you, thank you, thank you. Worked like a charm! Ohhh. Thank u sooo soo much. Its really help full 4 us. Am having issues connecting with my google server on my samsung galaxy s. I can not access both my google play and gmail. Pls wat can I do? Nexus 5 not rooted. Tried everything except full reset. Didn’t work. I can go to gmail in the phone’s browser with no problem – play store too. But not use the apps. In addition the chromecast app can’t see the device on my network, nor can the YouTube app, but Netflix etc can cast with no problem from the phone and all apps work on my wife’s Huawei Ascend P6 and our ipad2. I think google need to get some software engineers who know what they’re doing. If google apps don’t work on google’s flagship phone something is badly wrong. Judging by the length of time this problem has been around, it looks like they don’t care either. Sad. Nothing workings, stuck for days here. At the end, out of pure coincidence I found the culprit happens to be my router where some evil doers changed DNS setting. Thank you so much. It was the date & time. I’d removed the battery for something earlier & it must’ve dislodged the time setting. i have a problem with ma play store i can’t access without a code a redeem icon pops too. i have no card on the first place to put the code.every time i try to access a no connection appears and when a tap retry nothing changes.what should i do? Thanks for the solutions, works for me..
install latest ver of Playstore 4.8.20 and Google Play Services 4.4.52 apk’s. I used Airdroid. I had to free up space but it works. After I rooted my Android tablet, it worked faster removing the bloatware, although would start giving me proxy server errors, won’t connect, after I loaded a number of applications, especially the Play Store. I’d have to reboot to get a connection again. Anyway, your suggestion to Clear the cache of the Play Store app did it for me. Now I can open any # of applications and not get the connection/proxy problems. (I’m not on a proxy.) Thank you. host file solution worked for me. thanks a lot. Uninstalling the updates worked for me. Thank God the error message is gone finally. Try resetting your wifi device. It worked for me. 🙂 I tried every step written here but didn’t work, but resetting the wifi device or router worked. it worked for me ……………………. step 6 works for me. …..very useful post.. Thanks, the step 3 worked for me too… was about to go nuts. factory reset resolve my problem thank you. Deleting Host file solved my problem..
its working date and time . That’s why Titanium Back Up app is so important. Just restore Google Play, Services, etc and everything is back to normal. I tried everything on this page. What finally worked was rebooting my router. I should have thought of that sooner since I had two tablets that were having the same problem with google servers. I even did a factory reset on one of the tablets…live and learn. Thanks bro… Now I can brows. Sorry it wont work, any other option plz write. i have tried all process except factory reset. Thank you so much . it worked for me ! I googled the problem before spending a lot of time trying to fix it myself, and you saved me HOURS of frustration. Simply setting the time correctly fixed my issue immediately. I would never have thought to do that. THANK YOU! I went into my location settings and found that my google location service was turned off. I checked the box and opened playstore again and here to the grace of Almighty, i was successful 🙂 hope this one helps those for whom the above tips didnt work . Happy downloading! Love You Bro. You are great . I Had this problem with my samsung S2 since I bought it and i tries every thing but after using your method I was able to get my google account linked with all apps and my playstore started working. Thanks a lot … couldn’t figure it out ,happened to me on a MIUI rom .tried everything to fix .Changed Roms and it happened again ,Tried everything on this list .Then i tried clearing hosts.txt which worked perfectly 🙂 Thanks Again!! Root your phone, install file explorer, go to system/etc/hosts open with text editor and simply add ‘#’ before second line. Thank you so much, works like a bullet. Enable IGMP on your wifi router. thanks for posting this, issue solved! You’re the best! Great! 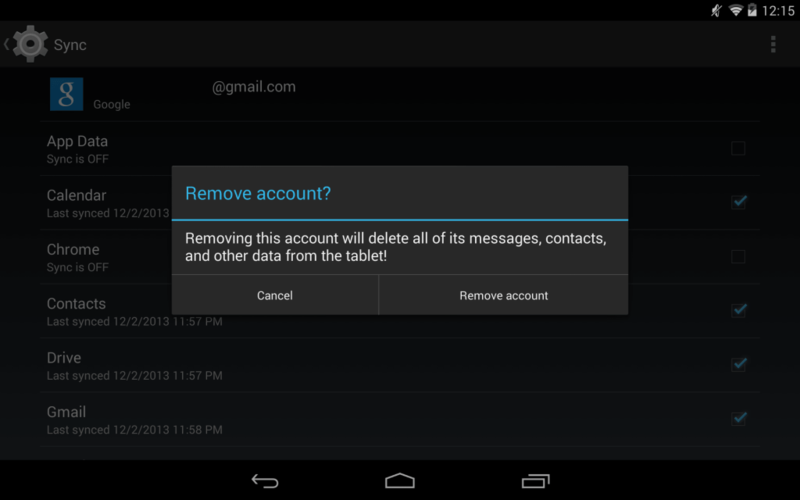 Removing and reinstalling my Google account works. However, this fix only works temporarily. I have to do this almost every time I want to download something from the Play Store. Very annoying. Anyone knows a more sustainable solution? I can’t delete the hosts file because the file system id read-only, what should I do then? man your a life saver thank you very much..
Thankyou very very much… I just got this andriod tv device MINIX x7 and was facing the same issue and I didn’t realize that I was using the device somewhere in the past. Changed the date and wala. option 7 worked for me. I tried it all After reseting my device i am not able to re sign in on my previous google account…Please help It says “cant recieve a reliable network” after it redirects to the wifi menu. I also tried wifi but it repeats the same….. Please Please Help.. Thank you! Very helpful tips! Unfortunately none of the solutions work. I cannot use Google Play Store anymore, it never connects. Also I have problem with sending emails and posting pictures in Facebook and Instagram (none of this was working, I could see my feed, but never could post or send anything). What could it be? Will I have to root my cell phone? In my router I set as firts DNS 8.8.8.8 and second 8.8.4.4 Then it wordks again. Strange that it always worked before and sudently it stops.. now with these dns nrumbers (google) it works again. Thanks a ton! The deleting hosts.txt file worked wonders. It saved the effort of reinstalling all apps which would have become necessary with a hard reset. The app which came in handy for deleting the hosts.txt file is ES Explorer. I downloaded total commander. I got to the host file, unfortunately not able to edit, delete, or even rename it. 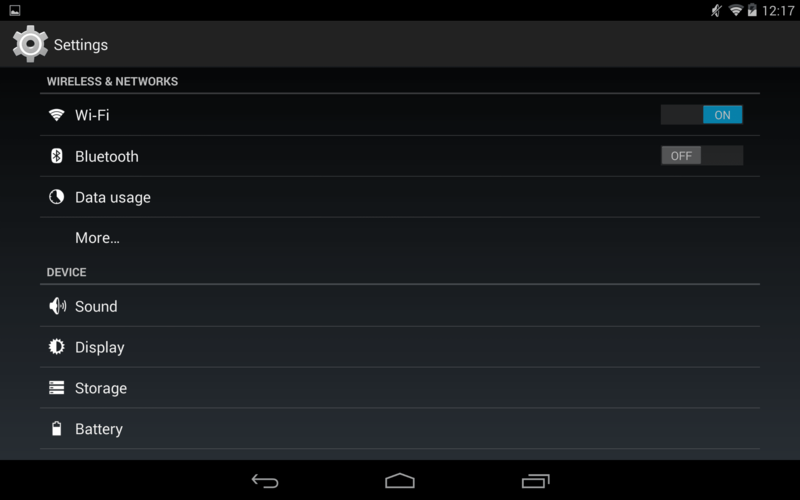 In the rwx it shows that I have read/write access. The issue I am having is not only with my android 4.4.2 version, two other platforms are having connectivity issues to this game at same time. One is an iPad 4th gen up to date on iOS, and a win7 computer ALL devices/platforms accessing the game “Jungle Heat” it’s a my.com game. I do have a little technical background, and I assure you I have no connectivity issues. However I soft booted the gateway and hard booted the gateway/router, epic fail. So at this point the error message that I get on all these platforms is connection error check your internet connection. There is no issue with anything connecting to the Internet, only with Jungle Heat! I tested my speed 4.8mBps, I connected to my mifi and got on jungle heat, it was slower as its rate is about 1/4th the speed! My mifi is for emergency needs, limited small package… I pay for the 16gb connection with AT&T Uverse. My thought that perhaps there is a setting I need to do within my gateway/router to tell it to let the packets or whatever come through… But damned if I know wtf to do. I appreciate the effort you have gone through in helping so many with their issue. I’m hopin, crossing fingers, getting a witches pentagram on the floor….whatevr it takes to try and figure this out and hoping you might have the answer. So first, I can’t edit the dang host file to any extent, tried adding the x in the rwx part, but it didn’t save. It won’t accept the command to change or rename …. How do I fix this? Then the Hail Mary… Can you give me your thoughts on why all platforms randomly have this issue at various times, not always daily, other than lately! I think it’s a setting in the gateway that can fix this…but what? Immediately!! Worked like a charm, very nice. yes bro 🙂 but i do not follow all of your tips..
but i just do 2 simple ways ..
1st. i just correct time time setting, from 12 hours type to 24 hours setup. 3rd. restart back my phone … then i try click google play store … 1st .. just i read back the same msg .. but the phone try to reading again the new setting that i already make before ..
then … yes it is working back .. from the white screen, then the gooogle play store os come back again and asking for update the google play program etc !! “NO CONNECTION” Problem i faced in my mobile but finally i solved just remove your account and re-add. But it keeps re appearing…. All the above steps didn’t work in my case.. I didn’t try the last one since I ws too scared to change factory settings n all.. Then I downloaded an apk for google play services from a site (latest version) After tht my play store n other apps started working properly. FOR THOSE WHO STILL DIDN’T GET IT WORKING. try it out. Thanks. @Justin can you add this also. I edited build.prop line as follows and it works fine. Thanks buddy. I had tried almost everything. The trick about deleting hosts.txt did the trick for me. Much love buddy ? My problem was server error code DF-DFERH-01, having worked through the list the one that worked for me was deleting my main google account, opening Play Store and re-signing into my existing account. I then had a deluge of updates which I had obviously not been receiving for some time. Once again, many thanks. I almost die!! Thank you. Super thank you! Whoever you are, you’re clever! ? here r some screen shots im having problems with !!! my tablet is call Tagital TX9 and this happiened a couple of day ago i have set the time / cleared all the cache and also did a factory reset and i still get that error message !!! please help ! thank you ! Thank you very much deleting the host file fixed my problem. DNS Worked on Note3. Thanks. I bet you can’t fix my problem is that, I rooted my phone. Then I used lucky patcher and patched on Play Store. Then my Play Store stopped working. By showing THERE WAS A PROBLEM COMMUNICATING WITH GOOGLE SERVERS. Then I deleted Play Store. And then I lost Play Store. So I done FACTORY RESET to get it back. But after the process I completely lost it. Still doing so much research I could not solve my problem. MOTO G2 is my device. Clearing play store cache worked for me. tnx boss. step 6 is working. Number 3 worked for me. Your types of Solution was really helpful. My mobile’s problem resolved through your 7th Solution.! This isn’t specifically related to the post, but I’m having issues with certain apps not accessible over Wifi on my Android Device. All other devices in our house have no problem accessing. But it’s Microsoft Apps, part of Twitter (can see tweets, can’t send Tweets or Direct Messages), Pinterest, my banking apps and a couple other random apps. Other apps, including a couple other Social Media apps, Facebook and Instagram I can connect to fine. But I’ve tried a lot of different things, resetting my modem/router, ISP says everything looks good from their end. I’ve also reset my phone. This is my 2nd Android device this has happened with. I know it’s something with the ISP because with my other Android devices and previous ISP, I never had these troubles.